This upcoming weekend is father’s day, and Baba Ganoush, in the original Arabic, means “Pampered Papa.” This is for all of you dads out there. If there is one thing that I have come to terms with over the years – it is that I am extremely frugal in the kitchen. I hate to put on the oven unless there is a 20-lb turkey in there, or three different items at the same time! In the winter, when I have something in the oven, I also bake off lots of potatoes and keep them on hand in the fridge so I can have home-fries for breakfast whenever I want. I have a weakness for farm-fresh eggs, sunny-side up, on top of the home-fries. Mmmmmnnnnn. Um, yes, I know. No brainer. 3. Remove seeds and then shred the squash by removing meat with a fork. 4. Serve with salt, peper and a little butter. Yeah, I know. How do I come up with these! So then I put a couple of sweet potatoes in with the squash. I ate one with the squash and put the leftover one in the fridge. A couple of days later, I put it through the ricer, added some chickpea flour and fried it as sweet potato pancakes with my cheese and mushroom omelet for Sunday brunch. It took me a long time to perfect my omelet, but I am now turning out satisfying French omelets on a regular basis. I promise a post on that later. My oven was full with squash and sweet potato, but I wasn’t done yet. I had a couple of eggplants/aubergines in the fridge, and a plan. I have a Weber grill, a monster stainless gas grill and a smoker – did I tell you that I hate to turn on the oven if I don’t have to. The outside grills provide a perfect venue for charring eggplant for Baba Ganoush. I, however, had my grill roaring away (if you can call 375 roaring) and perfectly good broiler space going to waste. So, I cut my eggplant into one-inch rounds, brushed them with EVOO and stuck ’em under the grill, beneath the oven. Grilling is not charring, but I got the eggplant both brown and soft, took them out of the broiler and diced them – throwing the still hot pieces of eggplant into a large bowl, then I added garlic, lemon juice, tahini and cilantro. I am also too lazy to get out a food processor or blender if I do not have to, so I brandished my stick-blender and made a rustic pulp out of the whole thing. I didn’t want a smooth pulp, so a stick blender worked perfectly imperfect for the job! Here is what I used. Your taste-buds may vary. The wonderful thing about Baba Ganoush is that – during the summer months – you can cook the eggplant on the grill, outside, and keep the kitchen cool. 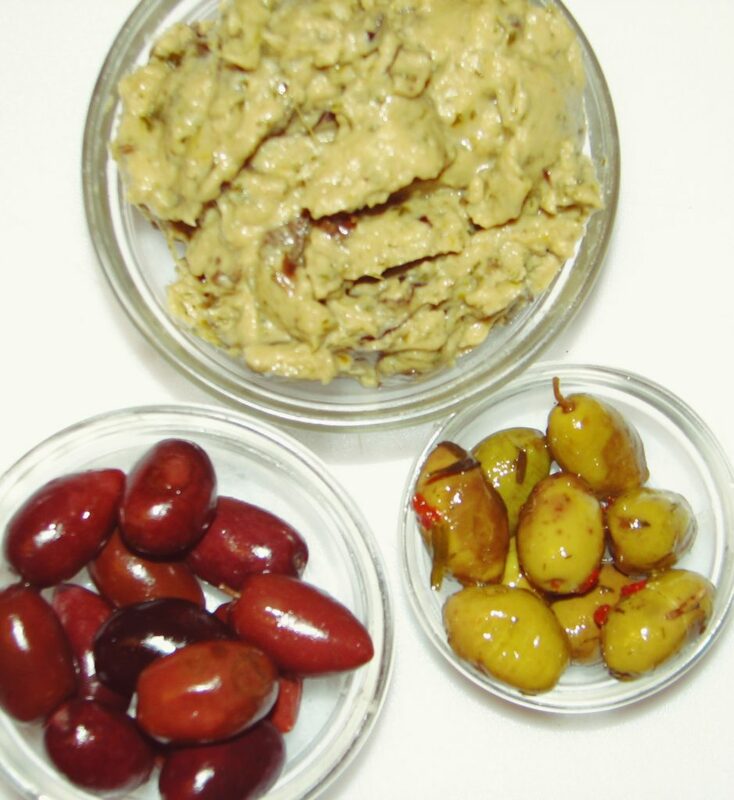 Thank you Al & Marlene for the wonderful olives from the always wonderful Mediterranean Deli in Oklahoma City.